Latest version: build #18 from 20.09.2009 18:26:56. 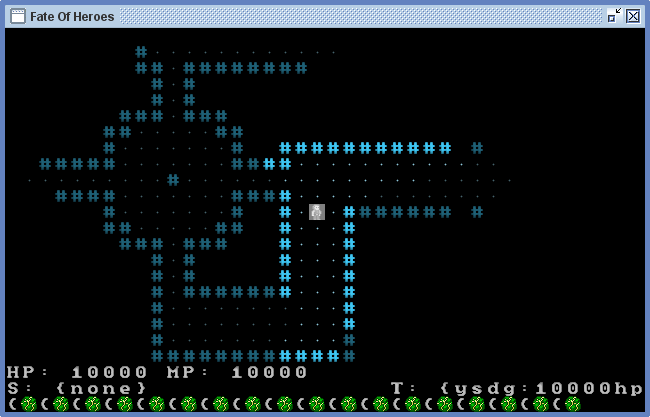 A java-based roguelike game in web browser under development. Look at screenshot or different screenshot. Check out sources and latest changes. Or, maybe blog was updated? Criticism and feedback is welcome, of course. Move around by using arrows. Kill something by moving to its location. [S] to upgrade skills - up/down arrows to select, left/right arrow to invest or uninvest points. [A] to swap around attributes - works like skills dialogue. While in menus, selected item is yellow, available commands are [green]. Quick 'n dirty: How to play? You start with some equipment, got to [I]nventory and [E]quip it - first select slot, then item to place to slot. Don't worry if were unlucky and did not get weapon or armor. Most actions (moving, attacking, using abilities ...) cost Action Points which regenerate over time, you can see bar with your points on bottom of screen. You also gain experience by killing foes, use e[X]perience dialog to mark skills or attributes to which you kill xp goes. When stuff dies, [P]ickup loot. You will find some runes. You can use them to upgrade equipment or to learn abilities in a[B]ility dialog. Ready a ability (i.e. Inferno) and [U]se it. It will not work well unless you exp as bit and assign points. Purple thingie you was right next to you is portal, walk to it to go to location on other side of portal. You need to have java installed and JNLP enabled. 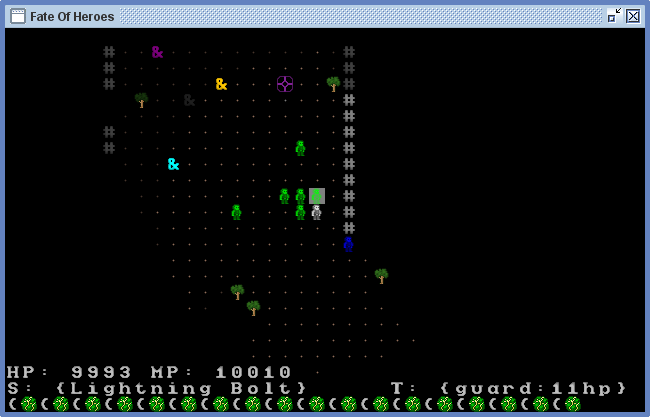 You see player character (gray guy in middle of screen) swarmed by some guards (green guys and blue guy). Green guard on gray square is currently being targeted, target being displayed on bottom right corner. Purple cross thing on top middle is portal. Tree looking things all around are trees and hash symbols represent walls. & symbols represent runes laying on ground. Bottom left of screems displays current health, mana and selected skill. Bottom row of screen diplays action points left. Kevin MacLeod for CC licensed music. Mike Mayday for his tile collection. Folks at JavaZoom for their MP3 playback library. Folks at Martian Software for their parser library.